This is a critical examination of the impact of sustained large-scale austerity cuts on local government communications in the UK. Budget constraints have left public sector media teams without the resources for robust citizen-facing communications. The "nose for news" has been downgraded and local journalists, once the champions of public interest coverage, are a force much diminished. The book asks, what is lost to local democracy as a result? And what does it mean when no one is holding the country’s public spenders to account? The authors present extensive interviews with communications professionals working across different council authorities. These offer important insights into the challenges currently being faced by communicators within local public services. The book also includes in-depth case studies on the Grenfell Tower disaster, the Rotherham child-grooming scandal and the Sheffield tree-felling controversy. These events all raise serious questions about the scrutiny and accountability of local authorities and the important role the media can and does play. Local Democracy, Journalism and Public Relations provides new empirical data on, and the real-world views of, working communications teams in local government today. 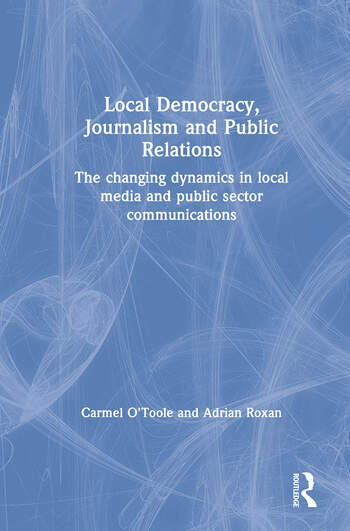 For students and researchers interested in local journalism and public relations, the book illuminates the current relationship between these professions, local democracy and political accountability. Carmel O’Toole has worked in journalism and public relations for public and private sector organisations, including local government and Channel 4, since 1979. She is a Senior Lecturer in Public Relations at Sheffield Hallam University, UK. Her research interests include local media and crisis communications management. Adrian Roxan is a journalist and public relations practitioner. He has worked as a journalist and in the field of public relations for more than 40 years in local government, the NHS and central government. He is currently a Senior Lecturer in Public Relations at Sheffield Hallam University, UK. His research interests include the media and its role in politics.